O love this quilt set. It's lightweight and perfect for warmer weather. I would recommend it. A cool, fresh addition to any contemporary bedroom, the Rowland quilt set from Laura Ashley is made from premium cotton fabric with unique quilting and a pleasant floral pattern in white and pale blue. Each set includes a pair of matching shams (one in twin size), and both the quilt and shams feature warm and weighty cotton fill. Conveniently machine washable and perfect for country-inspired spaces, this excellent set will invigorate your home for years to come. So sorry, but item listed is not the correct item. You have the wrong name for the pictured item. The Rowland quilt is a light blue with totally different pattern. I had to to go another website to find the correct name of the pictured item and order it there. Phone Customer service was great in helping get RMA and assuring I did not have to pay return shipping, but still have not received credit for my returned purchase. The online customer service people were not helpful at all - two just told me that colors differ greatly with different computer monitors!!! Gees, I guess so since this is not even the item listed and shipped!! Even after incorrect listing, customer pointing this out, returned merchandise - Overstock still has the wrong item listed. Was really hoping for better experience. I shop heavily online and never had this kind of problem with any online retailer. Based on the reviews, my concerns in ordering this item were: 1) Shrinkage 2) Color 3) Smell and not a concern, but important: 4) Comfort & weight So, here's what I found: 1) Shrinkage: The label states "prewashed" 100% cotton, and that the batting/fill is 80% cotton, 20% polyester. Seeing complaints of shrinkage I ordered a King size for a Queen bed. Before laundering it, I wasn't thrilled with the fit; the King draped down to within a couple inches of the floor on both sides. So I washed it and YUP, it shrinks like crazy. However the King size now fits our Queen bed as I'd hoped, i.e. the sides go down to just past the bedrails, and then the bid skirt is visible. I washed & dried on bulk setting, regular temps. I didn't want a pain-to-launder item, so no line drying or drycleaning for us. I would say don't expect it to fit like in the photo unless you use an unlaundered King size on a low Queen bed. Ours never puddled onto the floor as pictured, it was a couple inches up on both sides before I laundered it. 2) Color - it's exactly as pictured, a soft cottage-blue color. French blue. Nice, soothing color. 3) Smell. Someone mentioned a chemical smell. Indeed there was a bit. My husband didn't notice at all, I did slightly. He helped me spread it over our bed, and when we came back a couple hours later there was no odor. It is probably from the plastic packaging it comes in. It was delivered on a very hot day, so it might have been easier for something like cotton to absorb the smell, but it was very slight and went away quickly. 4) Comfort & weight -- I specifically wanted light weight, like a bedspread or very light quilt, and this is perfect for our needs. The material is soft and cotton-ey to the touch. Overall I'd give it 5 stars if the product description was more upfront and clear on the amount of shrinkage one could expect. For all the people who forewarned me to go up a size, thank you! And for those of you with a King size bed, either plan to never wash it, or to have a quilt that's small-ish for a King after you've washed it, because I think it would shrink some just washing it, even if you line dried. Final dimensions after one washing (usually takes a couple before cotton doesn't shrink more): 97 x 84.5. Hope this helps! This is a gorgeous, thick cotton quilted bedspread. I am so pleased I bought it. The color & pattern (I got the muted blue) are so pretty. The reverse pattern looks great with it, I fold the top down 5 or 6 inches so it shows against the shams. I sort of wish I could reverse the sham because it would be nice to change it up - but there is a big fold on the back of the sham to insert the pillow (not the discreet zipper at the side that some shams have) so just be aware only the comforter is reversible. All pieces look well made, I hope they will launder well. Love the quilt. Would like for it to be a few inches longer on the sides. Perfect for summer! Laura Ashley quilt sets are always done beautifully. This one is reversible. If the bed is folded down a bit it's very pretty. The shams are not reversible. It did shrink a few inches in the wash. However, it's still covers the bed pretty well Although could be a little bit longer. Good quality but not the same quilt as pictured! The quality was very good but the pattern was completely different than pictured. 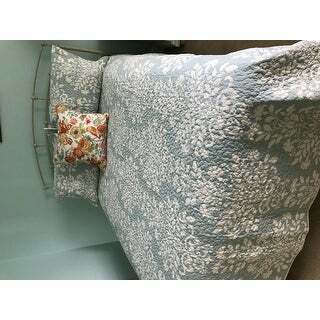 The quilt and shams I received was aqua blue with a white background floral silouette type pattern. The product was not the cornflower blue french toile look that is pictured. The reverse side of the items was also not cornflower blue, but rather a pale patterned white with blue floral. I would have returned it if I wanted the specific quilt pictured but the item delivered looked fine for my purposes so I kept it. The term "Rowland" and the item number were clearly identified on the packaging so why the picture doesn't match the item...I have no idea. I ordered two twin quilts and shams for extra long twin beds. The service was fast and accurate. The quilts are just a bit short of reaching the top of the beds so I folded them at the top to show the contrasting pattern and they look great. Very good quality and the price was right. Laura Ashley is a well known brand of bedding and other beautiful things for living. I have a queen size bed and ordered the Queen/Full size set in blue. It fits perfectly on my bed and matches the rooms color scheme of blue and white. The quality of the piece is top notch as expected. The Laura Ashley Rowland 3-Piece Quilt Set is beautiful and a perfect finish to my newly decorated bedroom. I received the quilt and the colors looked perfect. The trouble started when I unzipped the package. I am chenically sensitive to harmful chemicals and the smell coming from the quilt started to make me ill so I quickly put it back in the plastic bag. Your web site said it was made out of cotton. But, actually the tag said it is 60 percent cotton, 30 percent polyester and 10 percent new reclaimed fibers. What are reclaimed fibers made from? It never said. So, there are either horrible chimicals on the fibers or the reclaimed fibers are toxic. Either way I can't keep it and I certainly hope no one lays a baby on this quilt. Ordered this because of the size, weight and color....the color is no where near what is shown. It is a very green/blue bordering on aqua. Too much of a hassle to ship back, but I'm not a happy camper! I am thrilled with this beautiful quilt and sham. I would highly recommend this product. It is exactly how it is described in the description. Exactly as pictured. Good quality. I'm very pleased with this purchase. Make sure to take good measurements for width. I bought a queen for my queen bed and probably would purchase the king next time so it drapes over more on the sides. Beautiful quilt and washes well. Perfect in every way. A lightweight, summer quilt that is beautiful, well made, a perfect size for a twin, and exactly what I expected. Very happy! Enjoying this bedding set. It is very feminine and pretty. It is on a day bed in my guest bedroom. It is not very thick but looks good as decor. I decided that I wanted a new comforter and this Laura Ashley was perfect. The color is beautiful and it is really stunning on the bed. I bought a "King" to completely cover my Queen size bed. The texture is perfect. I love the soft color and feel. Also love that it is cotton, not polyester. This is a high quality item. Generous sizing & very pretty in presentation. I ordered it in the blue. It's brought a subtle pattern of softness & a calming influence to our master bed room. Wonderful price for such a classy item. Nice quality. Washes well. Pretty color. Highly suggest this sumptuous, peaceful lovely ovely pattern. Looks great in the room. And is very comfy to lie on. My daughter loves it. Love this quilt. I ordered it for my guest bedroom in Florida. Light weight, soft soothing color and can’t beat the price or the fast shipping! Next up is painting the room a light grey and we’re done. This quilt is very well made and washes up so nicely. It's light and airy colors make it easy to match to most any color of paint or carpeting. I recommend this quilt to anyone looking for a pretty quilt for a great price. Nice light weight that can be used year-round. Have had for close to four years now and has held up through all that laundering. Love the quality and the colors. I haven't used it yet but it looks like it will wear well. "Is the white a true white or an off white/cream color?" "What color is the reverse side of the quilt?" White with very tiny flowers that are the same color of blue as on the top of the quilt. Love love love this quilt! it's pretty white. I love this quilt. "As I have read through the comments I see people have said it is more of a green blue. can you confirm it is more of a grey blue?" It's not green or grey, it's blue. I really like the look of it, the only issue I had with it, is when I washed it in cold water and dried until damp, then laid out to air dry, it still shrunk. Order a size larger. My only mistake. "Is it true that this product has a chemical smell? Kathleen"
No. Mine did not have a chemical smell. I did wash it on gentle cycle cold water and dried on low heat before putting it on the bed. No. Mine smelled like new linens usually do, just wash before using. Perhaps the other customer was smelling the bag itself. I didn't notice a chemical smell. "Laura Ashley's website shows the Rowland quilt comes in three colors: Sage, Blue and Breeze. The title of this item doesn't say which it is. The Breeze is a "blue-ish" color too, which seems to be the cause of the confusion. Which Laura Ashley color is this set?" This listing is for the "blue" Rowland quilt set. "Is this quilt set more blue or aqua incolor???" "I would like sheets and bed skirt to coordinate. It's hard to tell if others will match. I love the pattern on the back side of the pillow shams. Can sheets and bed skirt be ordered in this pattern?" Hello Pamela, we do apologize, we do not currently offer the bed skirt or sheets at this time. Please feel free to contact us again with any further questions. Thank you for shopping with us!